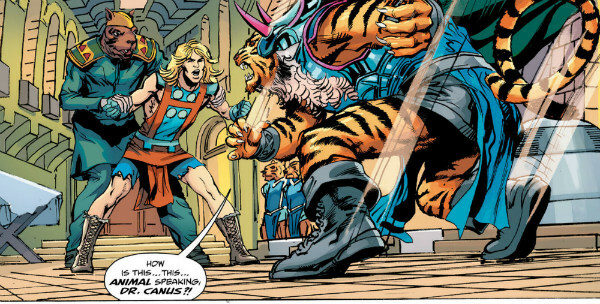 Engaging, appealing and embodying a welcome sense of sheer fun, Kamandi Challenge may just be the surprise DC hit of 2017. 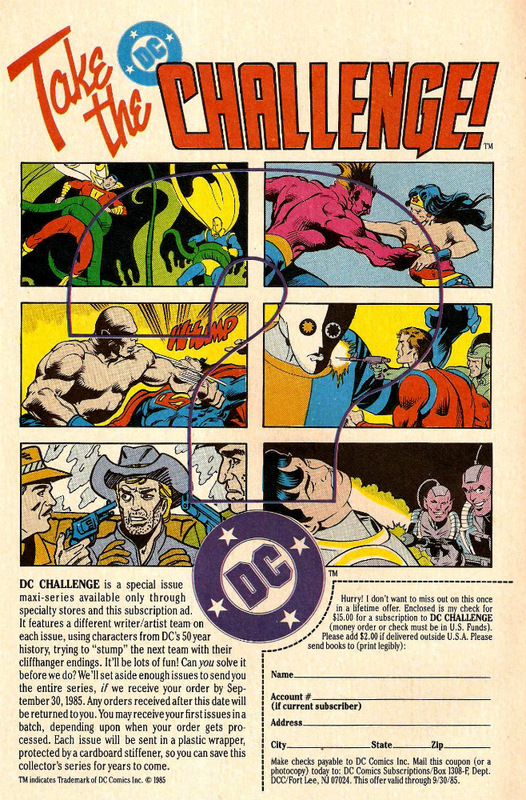 Over thirty years ago, during a period of constant experimentation from the publisher, DC Comics set into motion a series titled DC Challenge – an “exquisite corpse”-style 12-issue maxiseries with rotating creators who would end their monthly contribution on a cliffhanger for the next month’s creative team to solve. It featured some of the top established DC talent of the time – names like Marv Wolfman, Gene Colan, Gerry Conway, Dave Gibbons, Doug Moench, Curt Swan, Mike W. Barr, Gil Kane and Paul Levitz among many others – and put together big name characters like Batman, Wonder Woman, Superman, Captain Marvel and the Joker alongside obscure or unlikely guest stars like B’wana Beast, Congorilla, Detective Chimp, the Viking Prince and Son of Vulcan. 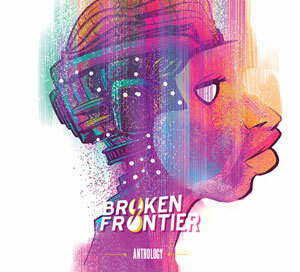 A glorious, wonderful, likeable mess, admittedly, but a mess nonetheless. The cover tagline question of “Can you solve it before we do?” promising with a monthly regularity a satisfactory resolution to all the myriad plotlines that never really materialised. 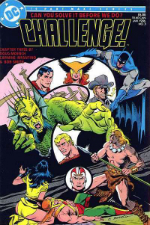 But, as a concept, the DC Challenge was potentially a lot of fun and the joy in this now reincarnated idea isn’t really in a coherent narrative but in seeing how incoming creators extricate themselves from the plot twists of the previous instalment. Last month DC made an unlikely return to the DC Challenge set-up with a more specific iteration in Kamandi Challenge featuring the titular Kamandi, “the Last Boy on Earth” – Jack Kirby’s much loved post-apocalyptic survivor living in the bizarre “post-Great Disaster” future society of humanoid animals. After the odd misfire of an introductory taster Kamandi Challenge Special reprinting 1970s stories that – with an origin exception – would have been largely incomprehensible to anyone new to the character (though we did get to see a Kirby Christmas Sandman story within its pages) the reader is thrown into the action at a rapid pace in Kamandi Challenge #1. The epic begins with a two-chapter opening salvo from the teams of Dan DiDio, Keith Giffen & Scott Koblish, and Dan Abnett and Dale Eaglesham, all vibrantly coloured by Hi-Fi. This double-header has the advantage of underlining the book’s core conceit without having to wait another month, as DiDio uses the “letters page” to reflect on Abnett’s solution to his story’s finale and explain how he would have got the hero out of that tricky situation. It’s fair to say that Kirby borrowed very liberally from the first two Planet of the Apes films in the early Kamandi days and that’s certainly reflected in the first two issues of Kamandi Challenge. 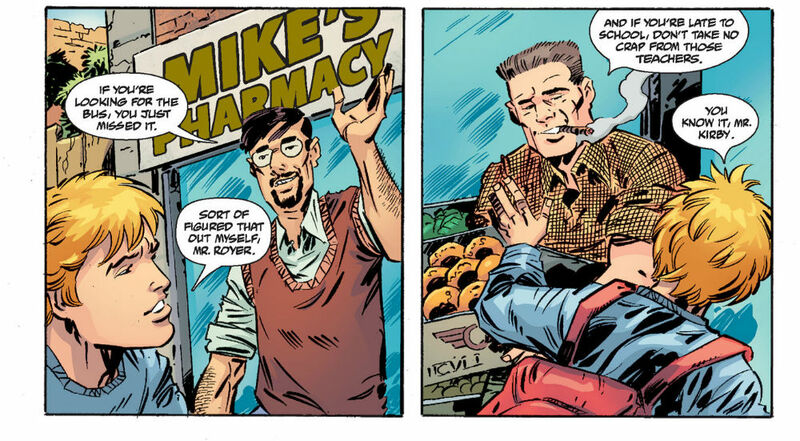 DiDio, Giffen and Koblish’s first chapter is full of loving nods to the character’s past (above) but suffers from its brevity. It’s difficult for the reader to empathise with the security of Kamandi’s home being torn away from him when we have so little opportunity to invest ourselves in his original circumstances in the first place. There’s also so much foreshadowing to be squeezed into such a short page count that it can’t help but feel rushed and a touch awkward in terms of pacing as a result. Dan Abnett and Dale Eaglesham (below) have the task of re-introducing the greater world of Kamandi to the readership and begin bringing in some familiar faces from the classic series like Canus and Prince Tuftan. Abnett’s approach is to immerse the reader in the culture and customs of Tiger City – Kamandi’s first involuntary stop on his journey – allowing us to experience this fantastical locale through his protagonist’s eyes. He ends with a climax that is perhaps an obvious one but no less dramatic for that. 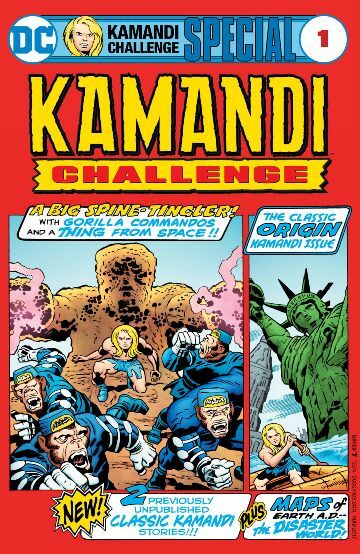 For many readers, though, it will be how the various artists involved interpret the visual splendour of Kirby’s original work in the pages of Kamandi Challenge that will be the biggest draw of the book. 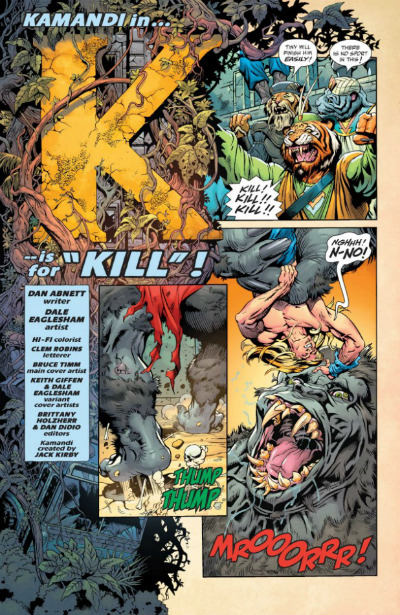 Giffen and Koblish’s take is a perfect evocation of the King without ever resorting to being a slavish copy while Eaglesham’s work has a more organic feel that captures a sense of terrifying spectacle to Kamandi’s surroundings. The second issue has the legendary Neal Adams (above) on art lending his fluid realism to Kirby’s outlandish concepts with powerful visual characterisation being a particular high point. 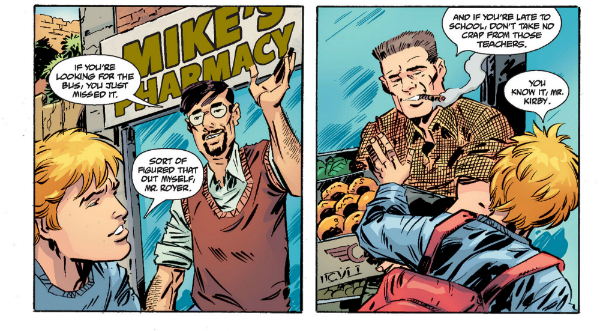 Clem Robins on the letters front on both issues contributes some dynamic lettering effects and a use of emphasis on dialogue that suitably heightens the melodrama of the piece. Enjoying not just devoted homages to Kirby but also alternate interpretations of his work will be key as the series progresses. 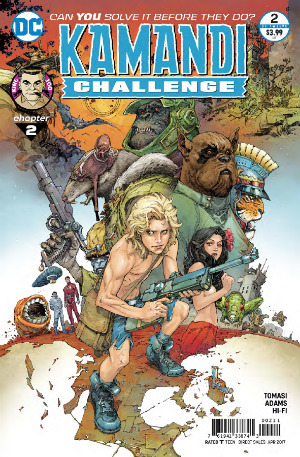 What we have in Kamandi Challenge is a comic that by definition needs to feel a little disjointed in execution as its success is contingent on the readership enjoying a narrative that continually shifts stylistically while still invoking the spirit of the seminal artist. 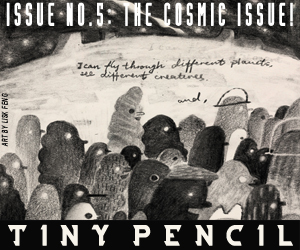 This is a project that asks its audience to interact with its twists and turns in a different way to their usual pop cultural comics consumption but it’s one with an unarguable sense of joy to its pages. Engaging, appealing and embodying a welcome sense of sheer fun, Kamandi Challenge may just be the surprise DC hit of 2017.